Small - £65.99 Medium - £65.99 Large - £65.99 X-Large - £65.99 Only 9 left! Let’s face it, you don’t need a bodysuit to be a superhero; but it certainly makes life more fun. Most modern day ladies are used to stretching themselves a little thin. Work, family life, volunteering, gluten-free baking,trying to make your apartment look Instagram-ready...it can all be a bit exhausting. But, if you're going to have to stretch yourself, wouldn’t be awesome to channel your superpowers (and have a really cute new outfit) in this Mrs. Incredible Bodysuit Costume? This look is just your ticket to a night off from the hustle that leaves you feeling rejuvenated to jump back into your adventurous life! Plus, your friends will finally see you as you really are: essential to their survival. We mean, you can actually turn into a parachute, if necessary, or a rubber boat. That’s a metaphor, people. Or, you may find it more fun this Halloween to use your arms as a slingshot and take aim at all those good-for-nothings who ask you to pick up the extra slack. 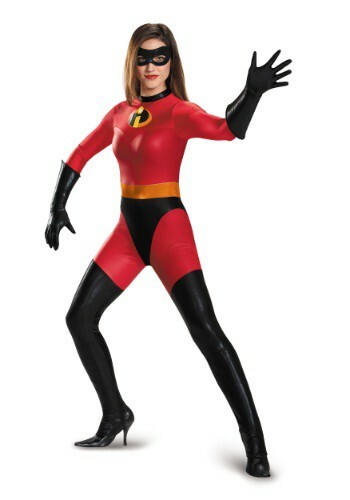 Regardless of how you choose to spend your first hours with superpowers, you’re going to look amazing zipped into this red spandex bodysuit with the Incredibles printed logo on the front. The gloves and character eye mask complete your transformation--but honestly, we can’t see that much of a difference. Before you were a rockin’ lady with incredible powers and an ability to stretch to fit the needs of your busy life. Now, we see the same thing--but in a cool bodysuit! Good thing you’ve been making time for all that yoga--it’s time to stretch your potential tonight!